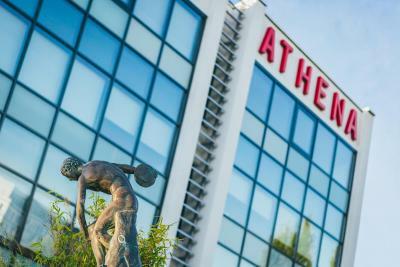 Lock in a great price for Hôtel Athena Spa – rated 8.7 by recent guests! Great location, near public transportation! Parking on premises is free. The free pool was absolutely amazing - my 3yo loved it! Missed to get a massage, but I'm sure they are great, too. Loved the modern rooms that were fancy but not uselessly fancy (rather just convenient). Extremely friendly staff and great room service, too! Everything was really nice and amazing. Highly recommended. The staff was very nice. The rooms were a good size and clean. The rooms are very modern. Good value for money. I was surprised at how nice the spa area was. Quite a large pool and a few rooms with Saunas and steam. The pictures don’t do justice. The location is close to town by tram or car. The rooms are clean, the staff is helpful and friendly. We enjoyed the pool, which is open till 11pm. The hotel features a nice garden, too.There is free parking space in front of the hotel, but it was always full later in the evening, so we parked in the hotel’s private garage for only 8€ a day. I absolutely recommend this hotel. 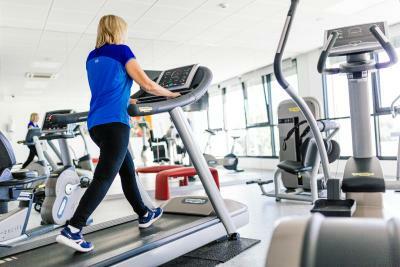 One of our top picks in Strasbourg.Hôtel Athena Spa is located less than 1.9 mi from the center of Strasbourg and features a fitness center that is open 24 hours a day. 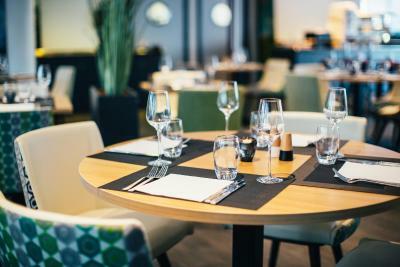 This design hotel has an à la carte restaurant, a bar and 24-hour reception. A free access to the indoor pool, open everyday from 10:00 to 23:00, is included. With free WiFi, the design and colorful rooms here provide a flat-screen TV with satellite channels, air conditioning and facilities for making tea and coffee. Featuring a shower, the private bathroom also comes with a hairdryer and free toiletries. A buffet breakfast is prepared every morning and a snack bar is available every lunchtime and on Sunday and Monday evening. 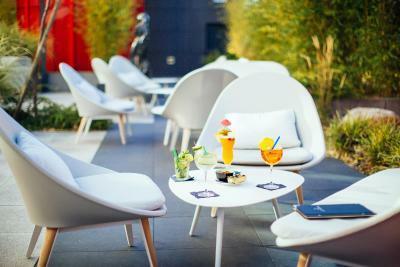 You can enjoy a refreshing drink from the contemporary bar, or relax on the terrace during summer. Outside the restaurant's opening hours the Hotel offers a snack service. 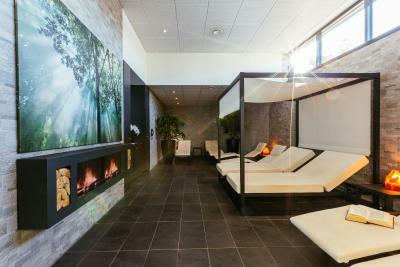 In the wellness section you will find a hammam, a Finnish sauna, a tropical sauna, a relaxation room and a sensory shower, which are available with a supplement of EUR 8.50 per person, per day. Massages and other treatments are available upon reservation. The spa section features an hydro-jet indoor pool, included in the price. Outdoor, secure, free private parking is available at this hotel and there is also an underground car park requiring an additional fee. It is 1.6 mi from The 'Petite France' and 1.9 mi from Strasbourg Cathedral. Strasbourg International Airport is 5 mi away. When would you like to stay at Hôtel Athena Spa? A flat-screen TV, air conditioning and facilities for making tea and coffee are provided in this room. The bathroom includes a rain shower, a hairdryer and free toiletries. A flat-screen TV, air conditioning and facilities for making tea and coffee are provided in this room. The bathroom includes a rain shower, a hairdryer and free toiletries. A fridge is also provided. 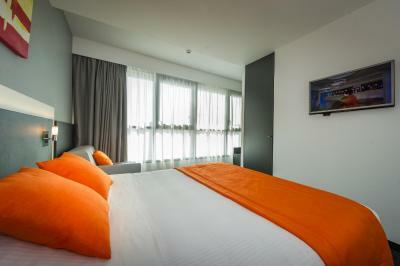 This spacious suite features 2 flat-screen TVs, air conditioning, a fridge and facilities for making hot drinks. The bathroom includes a rain shower, a hairdryer and free toiletries. Complete with a spa bath and a rain shower, this spacious suite features a flat-screen TV with satellite channels, a seating area and a fridge. It also includes facilities for making tea and coffee. The private bathroom provides a hairdryer, free toiletries and bathrobes. This suite includes free access to the spa facilities (swimming pool, hammam and sauna). Please note that the spa bath can not be used from 23:00 to 08:00. A flat-screen TV, air conditioning and facilities for making tea and coffee are provided in this room. The bathroom includes a hairdryer, free toiletries and a rain shower or bath. 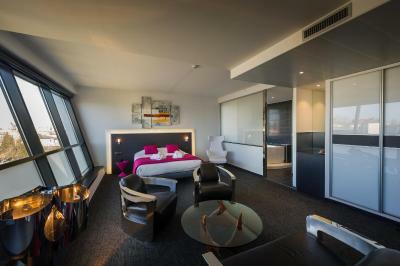 This spacious suite features a flat-screen TV, air conditioning, a desk and facilities for making hot drinks. The bathroom includes a hairdryer, a rain shower and free toiletries. One of the suites also has a small seating area. Providing views of Strasbourg, this spacious suite features a flat-screen TV with satellite channels, a seating area and a fridge. It also includes facilities for making tea and coffee. With a rain shower, the private bathroom provides a hairdryer, free toiletries, bathrobes and slippers. House Rules Hôtel Athena Spa takes special requests – add in the next step! 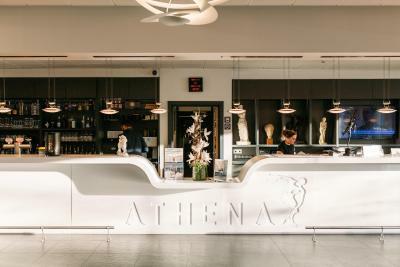 Hôtel Athena Spa accepts these cards and reserves the right to temporarily hold an amount prior to arrival. Please note that swimming shorts are forbidden in the swimming pool, only swimming trunks or boxers will be allowed. The parking offers 21 spaces upon availability. 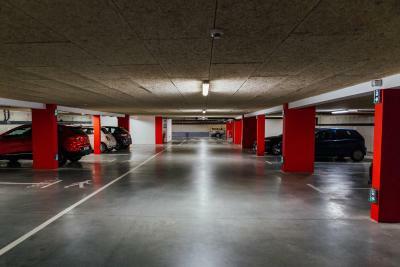 It also features an underground car park of 26 spaces with extra costs of EUR 8 per car and per day. 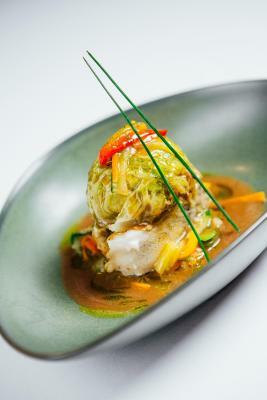 Please note that the restaurant is open from Tuesday to Saturday for dinner only. Some hooks in the room would have been useful. The shower floor is slippery - could have done with a anti-slip mat. The location is a bit out of central Strasbourg but there is a nearby tram stop. 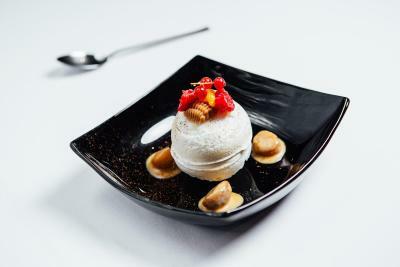 Restaurant is not open on Sunday and Monday evenings which is a shame as the food is good. Especially when the European Parliament is sitting in Strasbourg it would be useful for it to remain open. Good swimming pool - which is a rarity in Strasbourg. Short menu but excellent food in the restaurant. 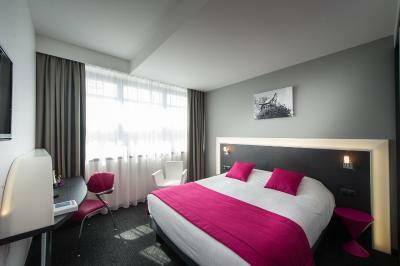 For a Strasbourg hotel during a week when the Strasbourg Parliament is sitting the price is reasonable. Very helpful staff. Great to have parking. Will return. The spa was really great. It was well maintained, functioning and clean. The staff was courteous and helpful. It is 5 minutes from the tram stop to city center. Staff should enforce visitors with cars using the parking that they park properly. 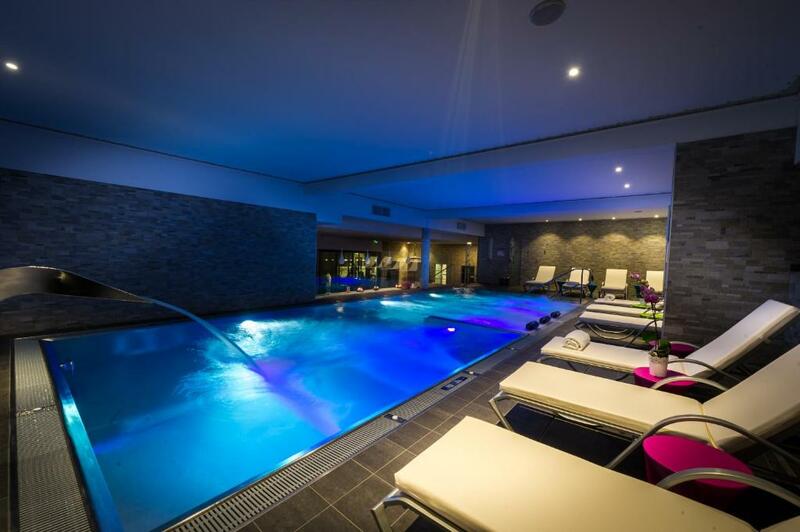 Excellent facilities, nice spa/pool, friendly staff, free parking (if you're lucky). Comfortable clean and parking was excellent. Great for a stop over on route to Italy . 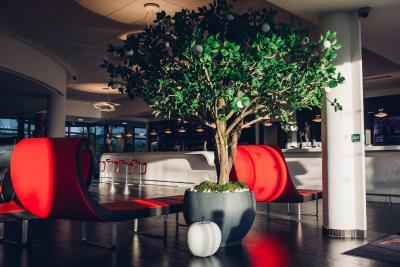 reception requires a fee to enter the steam room and sauna, and my personally think that hotel guests should enjoy the spa for free. Staffs, room equipment and swimming pool are clean and good. The hotel is located away from the city centre, but it’s convenient to take a tram to the city centre, by 5 minutes walk to Tram station. we stayed in a family suite (3 person) it was really comfortable, clean, silent. the price is also good. Its not walking distance to the city centre but we had a car so it wasnt a problem for us. I can easily recommend this hotel. The room seemed small. The hotel boasted a spa but the pool was small and the jacuzzi was cold. Also, the spa times were limited and I couldn't even use the sauna. Wouldn't recommend for a relaxing spa hotel. The location was convenient to the Tram stop and parking was easy.